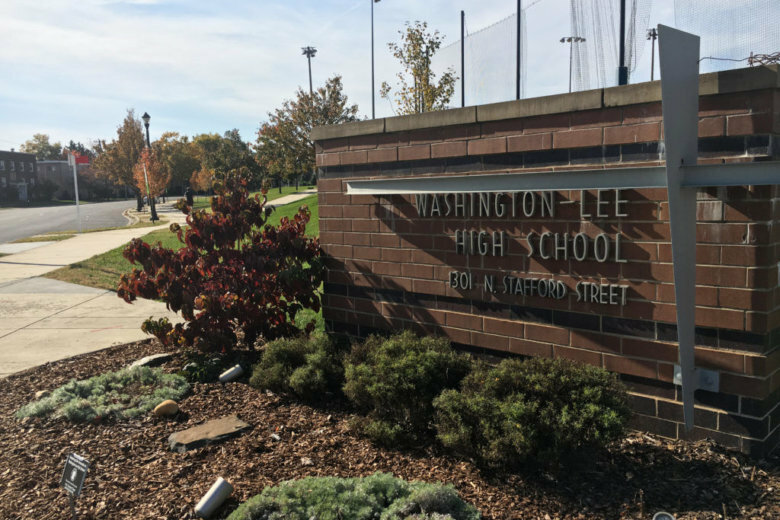 A judge has struck down a lawsuit challenging plans to rename Washington-Lee High School, though name-change opponents are holding out hope that they may yet convince a court to block the process. Three current W-L students were hoping to reverse the School Board’s vote to strip Confederate general Robert E. Lee’s name from the building, arguing that the Board misled the public and failed to follow its own established procedures in making the decision back in June. But Arlington County Circuit Court Chief Judge William Newman ruled Wednesday that the students didn’t have grounds to challenge the vote, and that the Board didn’t commit any errors egregious enough to warrant the legal action. Though he stopped short of tossing the case out of court or barring the students from adjusting their claims, he also granted a motion by School Board attorneys to dismiss the case, throwing up a key legal roadblock for the suit. “Even though I can see things could’ve been done differently here, I can also see that, under the statute, there’s nothing wrong here,” Newman said. For W-L alumni upset with the name change, about a dozen of whom watched the proceedings Wednesday afternoon, the result isn’t necessarily unexpected, but is disappointing nonetheless. Many have spent the months since the renaming vote aggressively pleading their case, with some even backing an independent challenger to one of the Board members who supported the name change. Dean Fleming, one W-L alum who’s helped marshal opposition to the name change, told ARLnow that the ruling won’t deter those efforts, as it merely gives opponents “another bite at the apple.” Jonathon Moseley, the attorney representing the students, was a bit more hesitant, however. Chiefly, Newman agreed with many of the procedural arguments raised by the Board’s attorney, John Cafferky. Moseley and the students claimed that the Board erred when it first voted to change its policy governing the names of all Arlington Public Schools, then decided to initiate a name change for Washington-Lee immediately afterward, citing Lee’s “principal legacy” as a soldier for the Confederacy and defender of slavery. Yet Cafferky pointed out that the Board largely followed the process it laid out in September 2017 to govern the name change deliberations. Though the Board did circulate some other possible guidelines in January that would’ve called for another round of community engagement before a name-change vote, Cafferky noted that the Board never formally adopted that change, and stuck with its initially established procedures. Procedure aside, Moseley and the students claimed that the school’s name was “part of their community experience,” and changing it would force them to shell out cash to change the names of uniforms and clubs. Yet Cafferky argued that such negative impacts on the students were “speculative,” considering that Washington-Lee won’t actually receive a new name until the Board votes on the matter next month. Similarly, he pointed out that the Board is considering “Washington-Loving” and “Washington-Liberty” as the new names for the school, which could avert the need for any cumbersome logo or uniform changes by maintaining the “W-L” acronym. With Newman’s ruling, the Board’s renaming work is set to move ahead (though it has not been without additional controversy). The Board will review new name proposals for the first time tomorrow (Thursday), then is set to vote on the matter on Jan. 10. Moseley said his clients may well file an amended suit before that vote, though the impending holidays could complicate scheduling.